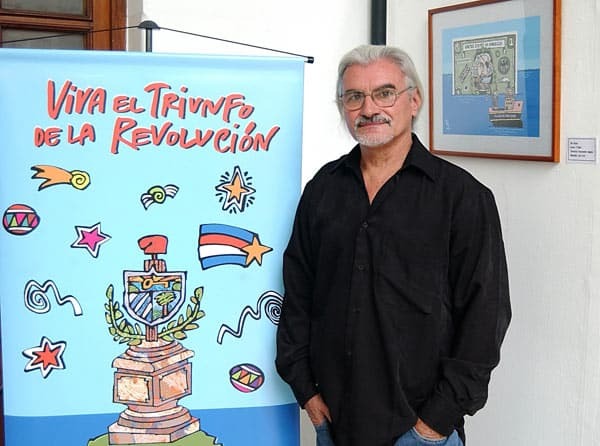 Born in Barajagua, Holguín, Cuba in 1949, Tomás Rafael Rodríguez Zayas (Tomy) became recognized in the universe of Cuban cartoons in the late 1960s. From 1968 he began to work for Juventud Rebelde and soon became part of the golden era of Dedeté, the humor supplement of this newspaper. His work as a cartoonist, for which he received innumerable national and international awards, distinguished itself on political issues as well as humor in general. Tomy moreover ventured into other genres of visual arts such as illustration, design, painting, printmaking, and mural. Until a little before the heart condition that eventually would cause his death was diagnosed, Tomy maintained a cartoon section for the Cubasí portal and was a tireless collaborator of the Cambios en Cuba blog. Those who personally knew this modest and eternally cheerful country boy from Barajagua deeply lament his death. M. H. Lagarde, a Cuban journalist, is the director of the Cubasí portal. Cambios en Cuba is his blog. The original article “Falleció Tomy, gran amigo y caricaturista cubano” was published in Cambios en Cuba on 6 September 2010. Translation by Yoshie Furuhashi (@yoshiefuruhashi | yoshie.furuhashi [at] gmail.com).